Perched high above the Coachella Valley, minutes from Palm Springs, California, I discovered an alpine forest with towering trees and summer temperatures rarely reaching 80F. As the seasons change, the treed oasis transforms into a winter wonderland perfect for a day of sledding or snow-shoed exploring. 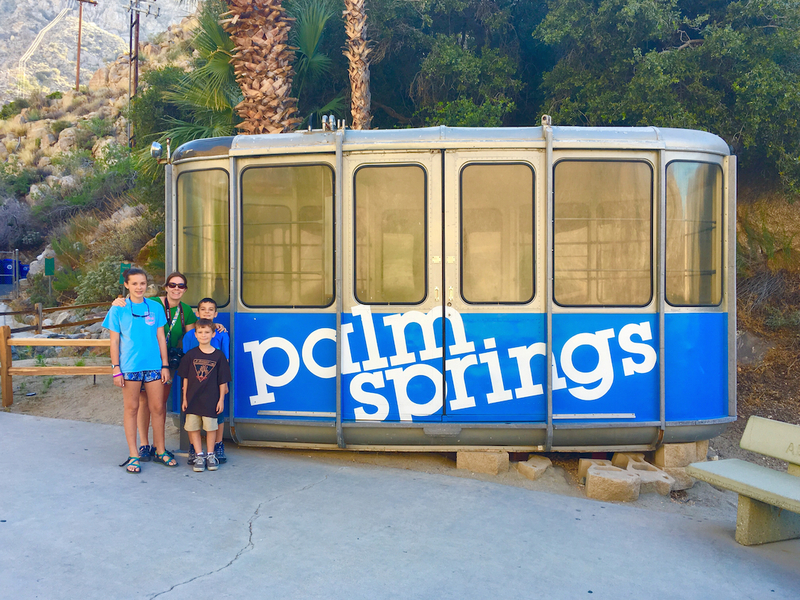 Climb aboard the Palm Springs Aerial Tramway for a breathtaking ride in the world’s largest rotating tram cars. My kids love different. So when I told them I wanted to ride a rotating cable car up the side of a mountain to visit our next national park site, they were all in. On the southerly side of the Coachella Valley in southern California discover the Palm Springs Aerial Tramway. This tram ascends 2.5 miles to the Santa Rosa and San Jacinto Mountains National Monument, an alpine oasis perched high above the Palm Springs desert. The idea of a tram began in 1935 yet took close to 30 years to fund and build this marvel. After years of road blocks and halts for major wars, construction began in 1961. Only the first of the tram’s five towers can be reached by road and the remaining towers along with the Mountain Station (the terminal building for the tram) utilized helicopters to complete the construction. In all, over 23,000 helicopter missions flew the necessary workers and materials for the 26-month long construction period. The Palm Springs Aerial Tramway opened to passengers in 1963. The Santa Rosa and San Jacinto Mountains National Monument was created in 2000 to protect the pristine alpine wilderness. The majority of the Mount San Jacinto State Park is within the monument’s boundaries. The Mount San Jacinto State Park offers 54 miles of trails. During our visit, we hiked from the Mountain Station to the Ranger Station and then to Grubb’s View. 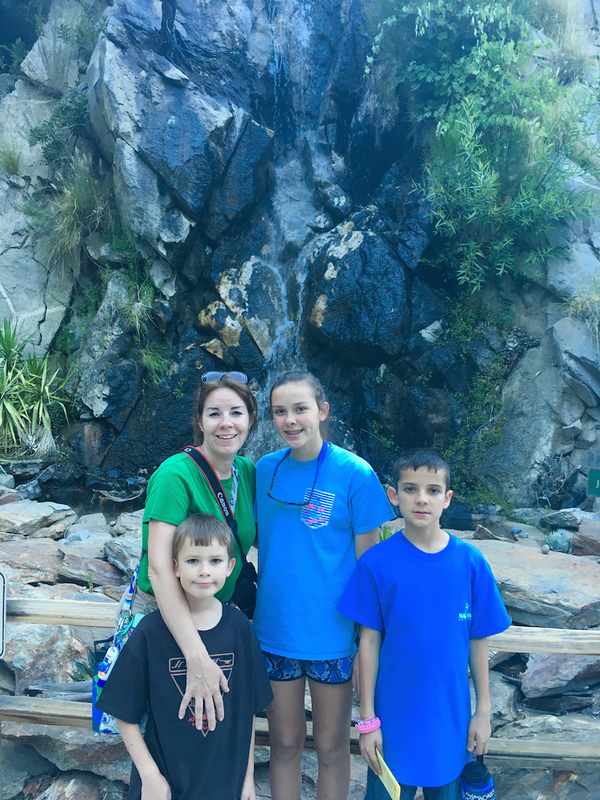 My three kids, 8, 12 and 13 enjoyed the hike along wide paths in the dappled shade with summer temperatures not reaching 80F. 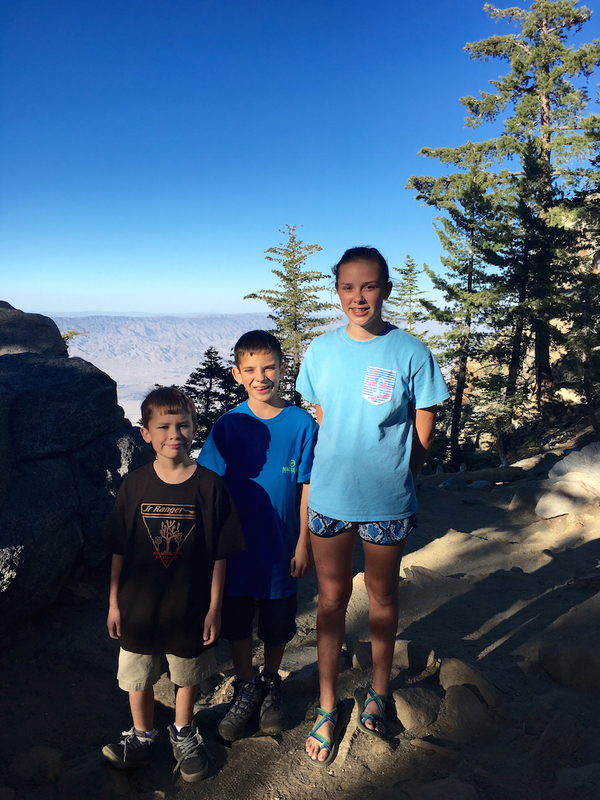 Kids can complete a Mount San Jacinto State Park Junior Ranger Nature Guide. Available at the Mountain Station, kids explore the wilderness while looking for plants and animals. Find four and kids get a signed certificate. The Mount San Jacinto State Park offers guided walks during the summer season from Memorial Day to Labor Day, every weekend. Volunteers guide hikers along a 40-minute walk and point out various plants and animals. Free. Looking for a snow play area in the middle of a desert? Take a ride on the Palm Springs Aerial Tramway to a winter wonderland. The flurries start to fall around Thanksgiving and the snow lingers through the winter. 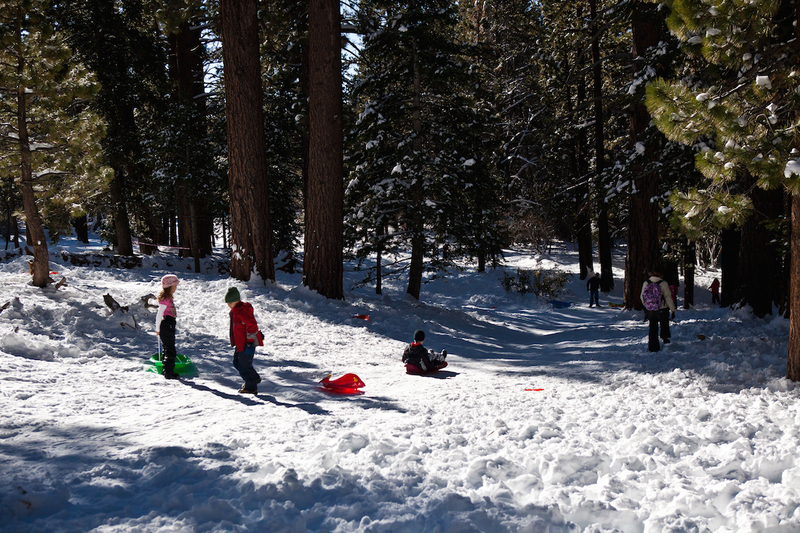 This is the only area near Palm Springs with a snow play area for sledding, snow shoeing, or cross-country skiing. The Adventure Center located near the Mountain Station offers snowshoe rentals and cross-country ski equipment. Sleds can be purchased along with winter-related items. If kids hate heights, the tram ride to the top might be a problem. My kids loved it though the tram car sways over each of the five towers. I found the ride to be gentle and quiet; it takes about 10 minutes to climb 6,000 feet. During our ride, the kids in our tram were great. A few of the older adults experienced slight vertigo issues with the tram car’s rotation. I suggest riding in the center of the tram and giving kids gum to chew to help with their popping ears. During my visit to Palm Springs, I stayed in the Walt Disney Technicolor Dream House, Walt Disney’s former home in the Indian Springs golf community. The ideal base for exploring Palm Springs or nearby Joshua Tree National Park. 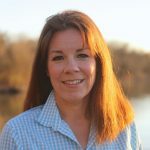 Looking for a rustic way to connect with nature? Mount San Jacinto State Park offers primitive camping in six different campgrounds. Ranging from a 2 to 6-mile hike from the Mountain Station, campgrounds offer vault toilets (not flushing). Water is not available. The camping fee is $5 per person and campers will have to fill out a free wilderness permit. During our visit, we spent several hours hiking so the kids needed a break and a snack to keep them happy. The Mountain Station offers a couple of dining options. The Peaks Restaurant offers fine contemporary California cuisine with a view of the Coachella Valley. The Pines Café is a casual cafeteria offering kid-friendly options like pizza and sandwiches. The Lookout Lounge provides the ideal spot to enjoy a cocktail while watching the sunset. 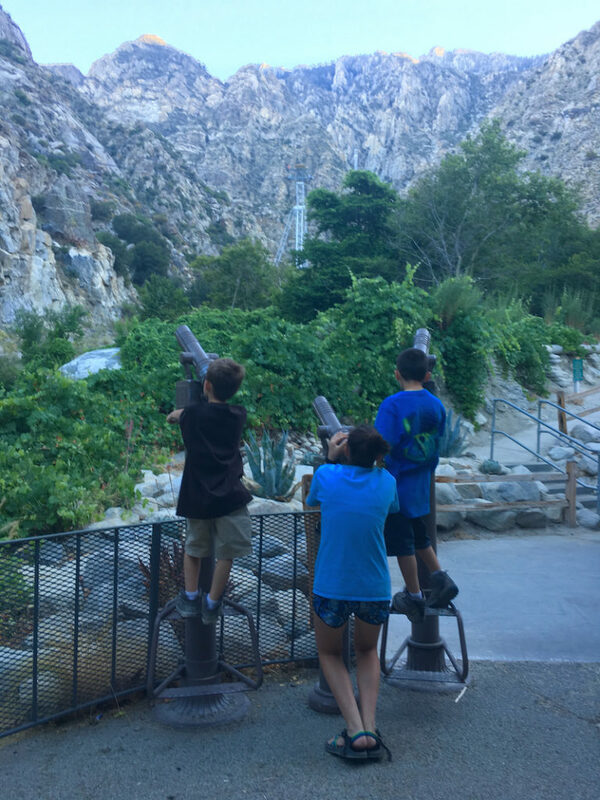 The most family-friendly route to the Santa Rosa and San Jacinto Mountains National Monument is the Palm Springs Aerial Tramway. It thrilled my kids and made for a memorable day. My kids loved the rotating tram car ride to the top as our Swiss-made car that made two complete rotations. 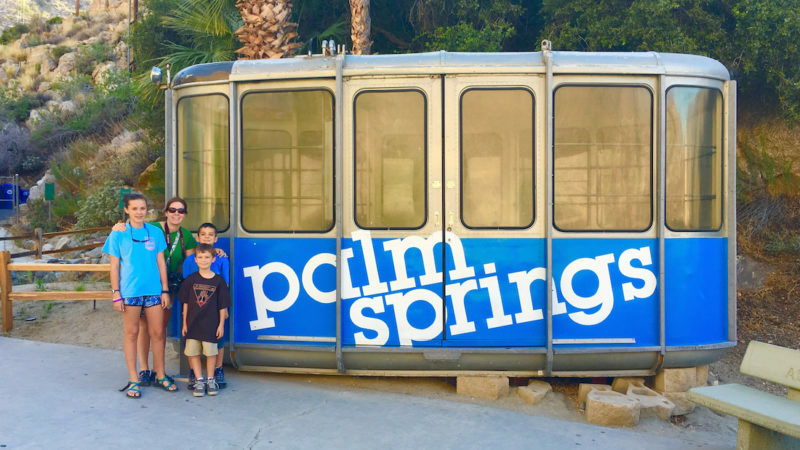 The Palm Springs Aerial Tram traverses 2.5 miles and gains 6,000 feet of elevation as it moves over five towers with a little sway. 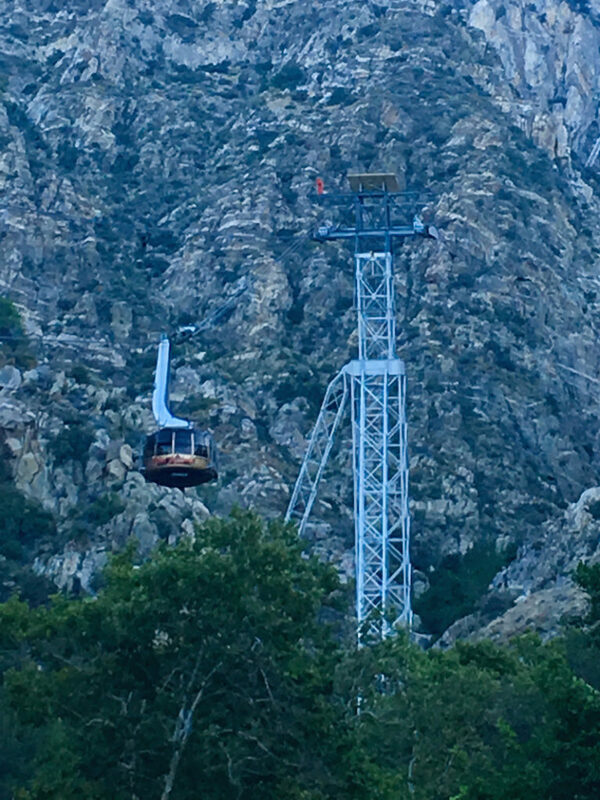 The Palm Springs Aerial Tramway located at 1 Tramway, off Highway 111 with easy access from Interstate 10. Located six miles from downtown Palm Springs, it’s open seven-day-a week. For national park enthusiasts, Joshua Tree National Park is 40 miles away. Mojave National Preserve is 115 miles north. Santa Rosa and San Jacinto Mountains National Monument is open 365-days a year as is the Mount San Jacinto State Park. They are free to enter though the Palm Springs Aerial Tramway requires a ticket for all passengers. Adult tickets are $25.95 and kids 3 to 12 are $16.96, with kids under 3 riding for free. Parking is $5 per vehicle. The Mount San Jacinto State Park offers a 30-degree differential from the valley below. Use the restrooms in the tram buildings for flushing toilets. Take it easy at higher elevations, especially with younger kids and older adults. Pack some snacks and water bottles. Wear hiking shoes if you plan to explore the hiking trails. Palm Springs Aerial Tramway is closed for annual maintenance in September and during inclement weather.